Cheese lovers prepare for a voyage into the mouldy, tangy, fruity, salty, sweet and smelly (and many more besides) world of cheese in these 12 indispensable cheese guides. 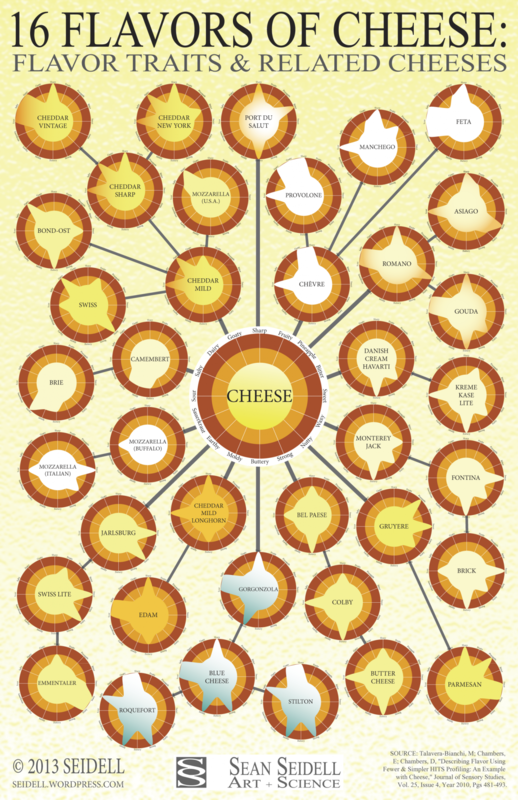 We'll have you separating the whey from the curds, your artisanal from your industrial and your goat from your sheep cheese in this selection of informative infographics for most cheese centred occasions. By the end you'll be able to navigate your way through all different types of cheese, serving your cheese board like a boss, paired with the right wine or beer and those all important wafers. And after all that, it's just a case of storing your cheese correctly to enjoy it all over again. This mammoth wheel of 66 cheeses is a great starting point on any cheese journey. Cow, sheep, goat and buffalo cheeses are all identified, further defined by texture, from hard to soft, with handy visuals on colour and form. How many have you tried? This nifty cheese guide to 16 flavours has some weighty scientific testing behind it and will help you identify traits of 'families' of cheeses that you enjoy. For example if you're a fan of stilton, chances are you'll also enjoy a finger of Gorgonzola, Roquefort or Blue Cheese, even though they come from totally different countries and regions. This guide is a great starting point for learning some cheese basics, from identifying your favourite sheep's milk cheese to your preferred buffalo cheese. Plus offering up some interesting little known facts, like the UK having more varieties of cheese than Italy or France. Stuck on what to eat with your favourite cheese? Here's a handy guide to 19 of the most popular cheeses around the world with what you can enjoy best with them, like the classic brie and baguette combination. Learning how to prepare a cheese plate like a boss will come in handy for entertaining. This is a neat and simple guide to getting a balance of textures and flavours from your cheese selection along with what to serve alongside. If classic cheddar cheese is your fridge staple, here are some cheesy facts about the beloved cheese, from its 12th century British beginnings to its USA dominance. If Dutch cheese is more your thing here's an interesting guide into exactly how it's made, from the three step milk pasteurisation process to kick off proceedings down to the final 'plastification' of the cheese where the distinct plastic layer is applied to the exterior of the cheese round. 8. What is Artisan Cheese? 'Artisan' is a word becoming increasingly popular connected to food production, particularly when connected to cheese. 'Artisanal' cheeses are highly sought after for their unique characteristics that are otherwise eliminated in more industrial cheese making. Here's an interesting guide to put those cheeses into context. If you're planning on serving cheese at a dinner party this is a great guide to how to make the most of flavour combinations with both wine and other food like meat and crackers. If you prefer beer over the classic wine cheese combination never fear, there are several cheeses that will accomodate a good pint of ale being drunk alongside. Take a look to find your favourites. If you're a cheese fan here are 16 bits of trivia to impress your cheese loving friends next time you're sharing a cheese board. And finally, we finish with some cheesy facts and figures for all you curd nerds, from how it all began to who eats the most. Enjoy!